Recording of Workshop 1. March 19, 2018, Sacramento. Uploaded by CaPSPDNow Webinars on 2018-04-03. Webinar 1 with Math subject matter specialists. Full webinar with Margaret Heritage and Math subject matter specialists. Webinar 1 of our Formative Assessment series with Margaret Heritage and our Science content area expert. The first webinar in our Formative Assessment series with Margaret Heritage and our ELA subject matter specialist. The first webinar in our formative assessment series with our history/social sciences content area expert and Margaret Heritage. Margaret Heritage hosts the second webinar in our Formative Assessment series with ELA and History/Social Science subject matter specialist. Margaret Heritage hosts the second webinar in our Formative Assessment series with subject matter specialists in Math and Science. One of our most popular presenters, Margaret Heritage returns to delve deeper into Formative Assessments. Select the button below to see what some past attendees of her Formative Assessment workshop had to say! She joined WestEd as Senior Scientist in 2015 after 12 years as an Assistant Director at the National Center for Research on Evaluation, Standards and Student Testing (CRESST) UCLA. Prior to CRESST, she was principal of the laboratory school of UCLA's Graduate School of Education and Information Studies. Her current work focuses on formative assessment, particularly as instances of co-regulation. In addition, she is conducting research on language learning progressions as the foundation for formative assessment with English Learners. She also serves as associate editor for the journal Educational Assessment. Her work is published in peer-reviewed journals, edited books and practitioner journals. Her latest book, Formative Assessment in Practice: A Process of Inquiry and Action and her co-authored book, English Language Learners and the New Standards, are published by Harvard Education Press. The Subject Matter Specialists will include language arts, mathematics, science and social studies specialists from Sacramento County Office of Education. These specialists have trained teachers and administrators in private schools throughout the Sacrament Region. 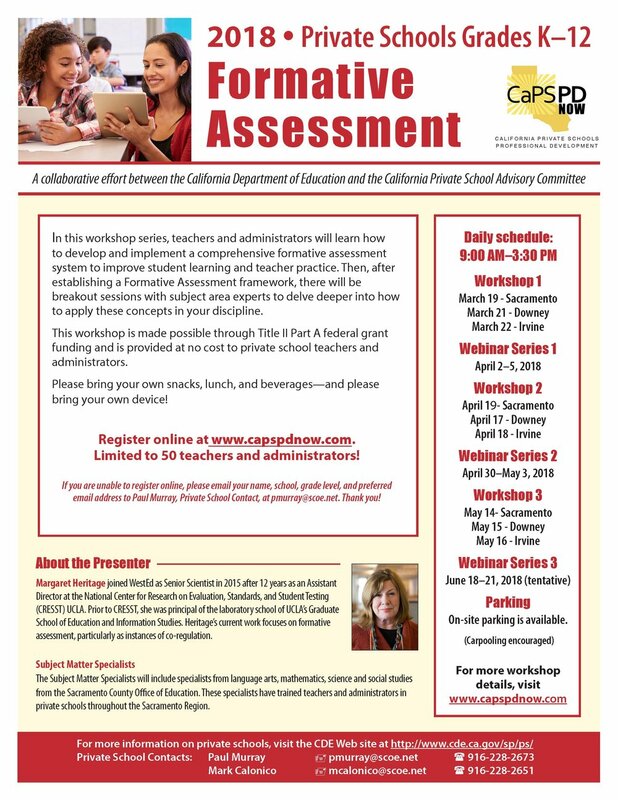 In this workshop series, teachers and administrators will learn how to develop and implement a comprehensive formative assessment system to improve student learning and teacher practice. Then, after establishing a Formative Assessment framework, there will be breakout sessions with subject area experts to delve deeper into how to apply these concepts in your discipline. There will be three face to face workshops with follow up webinars in-between the workshop dates. This structure allows the concepts and ideas to be introduce, taken back to your classroom to apply, and then come back to build on what was learned and refine your understanding and ideas. Understand the process of formative assessment: clarifying learning, obtaining evidence, interpreting and using evidence, and student involvement in the process. Consider the classroom conditions that contribute to a culture for formative assessment: routines, expectations, and participant structures. Develop at least one lesson with formative assessment (lesson guidelines provided) to increase skills with implementation. This workshop is paid for out of a federal grant from Title II funds overseen by the California Department of Education and the California Private School Advisory Committee. This allows for all costs for private school teachers and administrators to be paid for out of this grant. Food and beverages will not be provided. Please bring any food or drink you may want with you. There will be a 30-minute break for lunch. Our events are paperless, as a result, all resources and handouts will be provided in a digital format only. Please bring a web enabled device to access the materials. Registering for a workshop at one of the locations will register you for the entire series in that location.